Renovaid Team offers Wooden Bi-Fold Door in various designs to blend into the theme of your house. 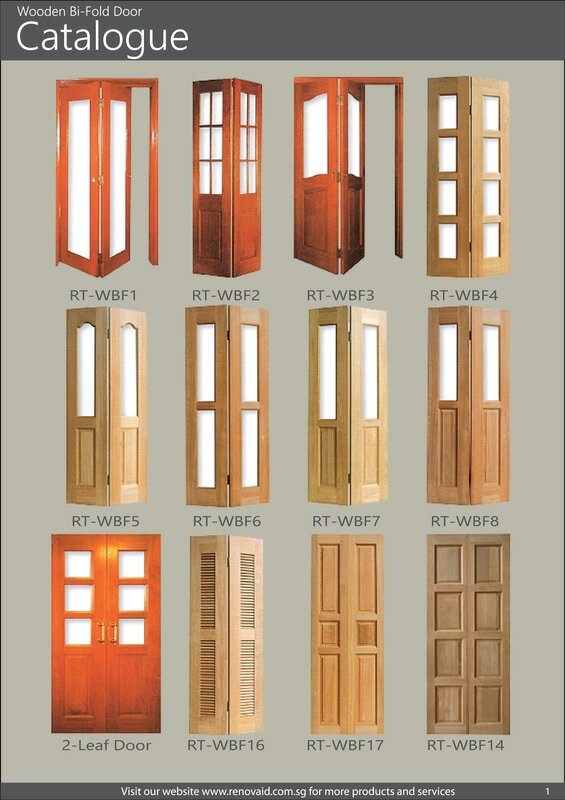 All the Wooden Bi-Fold Door supplied by Renovaid Team is manufactured by our wooden factory in Singapore. Bi-fold Door, also known as Folding Door is door that can fold in or out to free up a space in a desired location. Interior Bi-fold Door is gaining its popularity due to its folding capacity that will free up space. It is usually install in Entrance, Kitchen Entrance. Bedroom Entrance etc. Wooden Bi-fold Doors can also be used on exterior applications, where the doors open to connect the inside to the outside. Both interior and exterior Wooden Bi-fold Door offer amazing flexibility in design and are remarkably easy to operate, with a simple tracking system running along top and bottom of the panels. Wooden Bi-fold Door is designed to come in pairs, with two doors folding to one side, or with four doors that split in the centre and have two doors folding back to each side, and so on. Wooden Bi-fold Door provide the flexibility to be fully opened, partially opened or totally closed, depending on the amount of space required. Exterior Wooden Bi-fold Door also provides natural light, and the ability to connect the inside to the outside. Wooden Bi-fold Door is ideal for connecting living rooms, entertainment areas, gardens and patios and can be custom designed to meet individual tastes and specifications. They can also be used in restaurants and offices to create partitions and space. Wooden Bifold Doors usually come complete with track and fittings, can be opened inwards or outwards and are suitable for left or right hand opening. Most manufacturers of Bifold Doors will provide bespoke systems for either commercial or domestic applications and will provide a number of different colour and finishes (primed surface, unfinished surface, wood tone colour etc). Wooden Bi-fold Doors can be manufactured in timber or nyatoh timber, with a range of different styles (e.g. raised panel etc), textures (smooth, wood grain etc) and shapes (arched etc). The style of doors can be chosen to match the style of an individual’s home, whether it be modern, retro, colonial or classical. The Wooden Bi-Fold door should be able to carry the style throughout and create more space than ever thought possible. The Wooden Bi-Fold Door can be glazed with standard, toughened or laminated glass or double glazed, depending on individual preference.